We really like Siri and it’s undoubtedly useful, but unfortunately not all devices can run Siri, and sometimes Siri is just plain slow or doesn’t work. 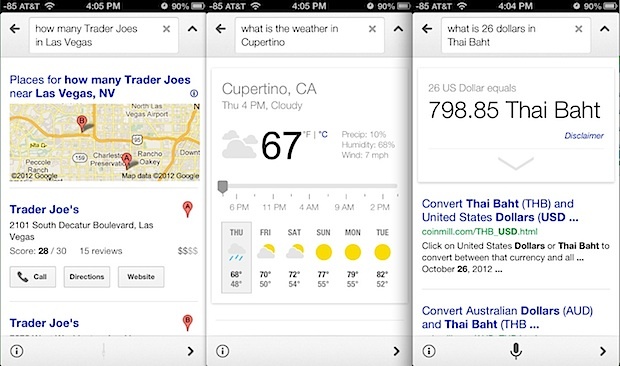 If you’re looking for an excellent Siri alternative that will run on everything, yes even iPhone 4 & iPhone 3GS, look no further than the latest versions of Google Search for iOS. Not only is Google Voice Search able to answer many of the same inquiries as Siri, it often does it faster and more accurately, since your voice question is translated immediately on the fly. Try asking other questions, anything Google Voice Search can’t answer directly will be searched for very quickly via the web, much like Siri. Google Search on iPhone is definitely impressive, the only real downside to Google Search is that it’s not tied into iOS, meaning it can’t launch apps, set reminders, and do anything that’s related to other tasks or apps on the iPhone, iPad, or iPod touch. In that sense, it’s less feature-rich than Siri, but that’s no fault of Google’s and it’s more to do with how iOS sandboxes apps for security reasons. Nonetheless, there is no better Siri alternative out there, and it’s completely free. Even if you like Siri a lot, Google’s voice search is still worth checking out because of it’s speed alone, and it’s a good backup solution to have when Siri sometimes inexplicably becomes unresponsive. Google Voice Search also has the distinct advantage of supporting a much wider range of hardware, and it runs on any iOS device with 4.3 or later, providing support for older model iPad, iPhone, and iPod touch that didn’t get Siri support. Like Siri, the device will need internet access in order to work, so don’t expect to use it without cell data or wi-fi. Excellent, my iPhone 4 is great but I wish it had Siri. Will give this a try! If your phone is jailbroken, try NowNow which will tightly integrate Google Search into iOS. You can even set it to come up like (or in place of) Siri. I’ll say something like, “Where is one hundred-eighty-first street and Hazen Avenue?” and while stopped at the next traffic light I’ll look down upon my iPad and see the marker on the map? Cool. The voice recognition is excellent and on-the-fly fast. I am using Dutch as my voice language and I’m impressed. The downside is that is uses the translated voice-to-text for a regular search on Google. In other words, it’s the same as typing but speaking goes faster. I have an iPhone 4 so I do not have any hands on experience with Siri but in my honset opinion, Siri is more interactive. With Google Search you have to do the extra step, looking through the search results. For example, when I ask what time it is, Google Search references to a link that may give my the information I asked. Siri gives it straight away.